Gather with other women in a sacred circle as we open our senses to the delights of the land, source our body’s wisdom, and awaken our ancient relationship with plant intelligence. With the land overflowing in summer’s abundance, we’ll enjoy a truly nourishing experience, in which we cultivate deeper joy, harmony, and well-being for ourselves and with the Earth. Read more here. Jane Valencia will be co-facilitating this retreat. September 20-22, 2019. Jane will be teaching two workshops at the Pacific Women’s Herbal Conference, held this year at Camp Sealth on Vashon Island. Check back for details! Saturday, March 2, 2019. 9am-3pm. Enter the medieval world in which the earth, the healing plants, and humankind are expressions of divine harmony and the redemption of God. We’ll explore the system and understandings from which abbess, mystic and skilled healer, Hildegard von Bingen (1098-1179) practiced her medicine, and engage with these healing ways ourselves. Cost: $65. Registration information is available here. Herbalist, nature instructor, and harper-storyteller, Jane Valencia loves helping others discover the wisdom and practical knowledge for health and wellness found within medieval and folk healing traditions. Packed with incredible stories for and by the community. Bring your own nature-based tale to share – personal, mythic, or ancestral. Audience participation, a 1-minute Story-thon, story improv games, and more. Jane will be offering a tale! Don’t miss this wonderful, family-friendly event! Explore Celtic Spirituality – 2nd Sundays, January-June, 4-5pm, Church of the Holy Spirit, Vashon WA. Join us as we explore different themes in Celtic spirituality by way of poetry, ceremony, lore, music, and more. Jane is one of the organizers of these events, and offers harp music, storytelling, and song, and also leads the children’s activities. July 2018 – Jane teaches at Vashon Wilderness Summer Camps for children and families, including Greenwood Secrets: an Herbal Magic Camp for Girls, Nature Mysteries for 4-6 year olds, and Nature Adventurers for 7-10 year olds. September 21-23, 2018. Jane teaches at the Pacific Women’s Herbal Conference, held this year at Camp Sealth on Vashon Island. She’s also directing the Kids Kamp! Wise Child Learning – In this workshop for kids and kids at heart, we’ll enter the world of the beloved children’s herbal fantasy novel, Wise Child by Monica Furlong, to experience first-hand what it may mean to be a “doran” – one who senses the pattern at the heart of all things, and who is dedicated to loving and protecting it – in relation to the plants. Deer Medicine Ways – The deer becomes our teacher as we assume deer form and ways to wander the landscape, engaging intimately with the plant world and its many gifts for the deer, and for us too. Late June and July 2017. Jane teaches at several Vashon Wilderness Summer Camps for children and families, including Greenwood Secrets: an Herbal Magic Camp for Girls, Woodland Ways for 4-6 year olds, and Family Camp. Wednesday, June 21, 10am. This event takes place at the annual Solstice Celebration hosted by the Women’s Red Way Lodge. Jane will once again be offering harp and storytelling for children. On the last weekend of March, the Nordic Heritage Museum (http://nordicmuseum.org/) in Ballard (NE of downtown Seattle) will hold their yearly Kalevala Festival, complete with music, song, food and libations – and storytelling! Since 2017 is the Finn Centennial Year, the museum be hosting the Marimekko textile exhibit from Finland – and will be featuring Seattle Storytellers Guild members telling the entire story of the Kalevala from noon to 6 pm on Saturday, March 25th. There will be a intermission in the afternoon. The epic spans from the Finn creation myth to the birth of the first man who is the wise magician, along with the greatest smith and a young rascal hero who all seek wives among the daughters of the magical witch of the north. Come early and see the exhibits and then listen to the story that was collected from Finn elders in the early 1800’s and is now published around the world. Jane will be telling an episode of this story with her harp. Catch it near the beginning of the storytelling! May 20th, 10am-4pm. We are Nature workshop series: Plant Spirit Healing Ways. Vashon Wilderness Program. Vashon Island, WA. $75 In many native traditions, plants are considered to be both our ancestors and our elders. They have offered themselves to us as food, medicine, and as materials since our beginnings. Join us as we engage with plant medicine not only for our bodies, but also for our minds, hearts, and spirit. Jane is delighted to be leading this workshop for adults. Friday-Sunday, 1st Weekend of March. Storytelling, Harp, and Threshold Choir singing. A Vashon Conversation for the Living about Dying . Jane will tell stories with harp, offer story and activities to children and their families, and sing with the Vashon Threshold Choir for this event. Death Comes Calling and Other Stories . . .
Come cozy up to stories from diverse world traditions that guide us to our deepest wisdom and offer pathways to resiliency and hope. Stories will be woven together with harp strings. Saturday, March 4, 2017, 10:30am 12:00pm. Sharing stories of gratitude and loss: everyday practices for listening to each other’s unfolding lives. Join us for our final event where you will have the opportunity to honor and celebrate precious lives of those who have died or are still living. Elements of the celebration: the Traveling Day Society drumming and music to honor the day that we travel from this life; the Vashon Threshold Choir singing songs for the dying; a fire burning cedar and lavender to lift our prayers, remembrances and wishes; a place to be surrounded in a Sound Bath by The Vashon Threshold Choir and spontaneous poetry. A labyrinth, built especially for this day, will be available for quiet walk and meditation before, during and after the event. Saturday, January 28, 1pm (Doors open at 12:30). Vashon Wilderness Program Tenth Annual Storytelling Festival. Vashon Theater. Jane will offer harp and storytelling at this event. This event will be packed with incredible stories for and by the community, plus audience participation, including a 1-minute Storython, story improv games, and more. Come enjoy the fun, and share in community the ancient and powerful tradition of oral storytelling. Thursday, Dec. 8, 7PM. Vespers at the Church of the Holy Spirit. Vespers is an offering of prayer and meditation for the Vashon Island community. Designed to be a widely accessible evening respite lasting about 30 minutes. I’ll be playing harp for this occasion. July 2016. Jane teaches at the Vashon Wilderness Summer Camps. VWP has fun and wondrous camps for kids ages 4-14, including Greenwood Secrets: an herbal magic camp for girls, and Woodland Ways for 4-6 year olds (both of which Jane will be teaching). Sunday and Monday, June 20-21, Time TBA. This event takes place at the annual Solstice Celebration hosted by the Women’s Red Way Lodge. This year Jane plays harp to greet the morning following a yoga session, and offers harp and storytelling for children. 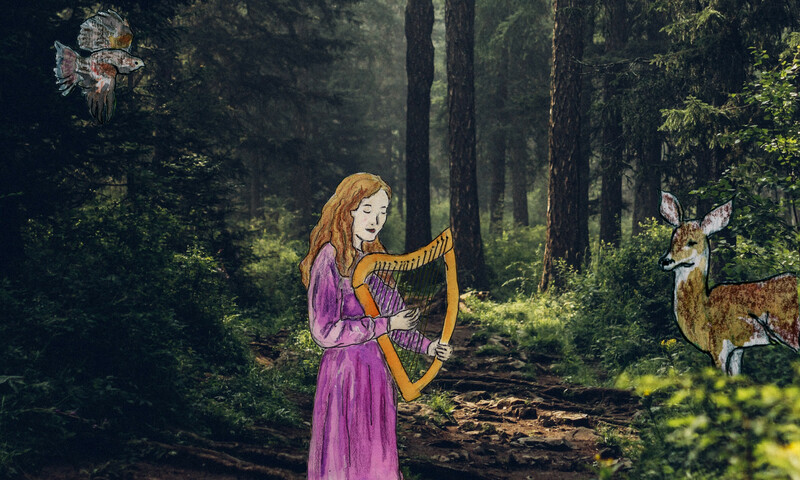 The Seattle Storytellers Guild invites you to a retelling of this wonderful Irish myth collected by Ella Young & told by seventeen storytellers and musicians. I’m delighted to contribute harp and storytelling to this event! Sunday, January 24, 2016. Two performances: 3PM and 7PM. Heart of Vashon: Telling our Story. Blue Heron – Vashon Allied Arts.19704 Vashon Hwy SW Vashon Island, WA. This performance reading is one piece of a community project that explores what matters to Islanders about living on Vashon-Maury Island as we roll into the 21st century. Why do we choose to make our home here? What is it that makes living here special? Over 150 people responded to the call for submissions, and a script was woven together from selections and excerpts of what Islanders wrote. An intergenerational cast of readers will share poems, reflections and stories that create a moving, humorous and thoughtful tapestry of Island life. Find out more here. Thursday, January 7, 2016, 4-5PM. Winter Tales: Harp, Story, & Song with Jane Valencia. Vashon Library, 17210 Vashon Hwy SW, Vashon Island, WA 98065. (206) 463-2069. Family Program – all ages welcome. Free! Discover a snowy forest where wondrous creatures share secrets of the newly awakened year. We’ll enter an enchanted landscape, make music together, learn some mischievous animal ways, play with poetry, and more! Jane Valencia is a bardic harper and storyteller who loves sharing nature-rooted magical adventure with kids and kids at heart. Her works include four harp CDs, a children’s fantasy novel, a kids herbal comic, and numerous blog posts and articles. Saturday, November 21, 2015, 10am to 4PM. Holly Daze Bazaar. McMurray Middle School cafeteria. 9329 Cemetery Rd SW, Vashon Island, WA Jane will offer live harp music and free micro harp lessons. She’ll also have news about her newest harp learning opportunities, which could provide a beautiful start for your New Year. We’ll also have Amri’s shoulder dragons eager to fly home with you to perch on your shoulder or serve as the perfect gift for a dragon lover, and a stack of contemporary fantasy novels ready to carry you or a loved one into the magic that is all around us. Sat.-Sunday, July 21-22, 10am-6PM. Forest Halls/DragonRider Press booth at the Strawberry Festival. Vashon Highway, SW. Vashon Island, WA. Visit our booth! We’ll have harp music, books, dragons, and plenty more magical fun. Jane will bring her harp. Come listen to her play, and have the chance to try out the harp yourself. July 2015. Jane teaches at the Vashon Wilderness Summer Camps. VWP has fun and wondrous camps for kids ages 4-14, including Greenwood Secrets: an herbal magic camp for girls, Woodland Ways: Faeries and Elves, and one that is even for young children and their special grownup. Read Jane’s blog post about them and find out more. Saturday, June 20, 2PM. This event takes place at the annual Solstice Celebration hosted by the Women’s Red Way Lodge. With harp, story, and song, Jane will be leading a fun kid-focused Sun Circle that honors the longest day. We’ll then head out, on the land to collect some “gratitude” to create a community gratitude poem. Go here to watch a special Solstice Invitation video about the event and to find out where to get more information (such as the location of the event). Friday, June 19, 7-9PM. Summer Solstice Labyrinth Walk at the Church of the Holy Spirit will be open to all who would like to come and enjoy a meditative walk to celebrate the summer solstice. With harp and voice, Jane Valencia joins vocalist Erin Durrett to infuse the garden with peaceful sound. The walking of the labyrinth is a sacred tradition that is thousands of years old and comes from many different areas of the world. It’s a practice that has become a way for people of all faiths or from no faith tradition to walk in contemplation of healing, gratitude and peace. Enjoy Harp & Story! Jane tells Chinese folktales from artist, storyweaver, and author, Suzanna Leigh‘s newly released book, Stories on Silk: A Peek into China on all days of the Art Tour, and playing my harp. Please join us at 2PM, Saturday & Sunday, May 2, 3, 9 & 10 at the Grange Hall, #1 stop on the Vashon Island Art Tour. Browse the amazing art at the Grange as well! The event is free. Sunday, March 29, 2015, 2-3PM. Because of the Red Fox: Harp, Tales, And Song. Vashon Bookshop. 17612 Vashon Hwy SW, Vashon, WA 98070. Experience the mischievous and magical world of Leaves the Red Fox and his human friends in this bardic performance rooted in Jane’s book, Because Of The Red Fox. For kids of all ages. Free. Friday, January 9, 2015, 6-9PM. Winter Tales: An Art Show by Jane Valencia. First Friday Gallery Tour Opening. VIA – Vashon Intuitive Arts, 177331 Vashon Highway SW, Vashon, WA, 206-463-0025. Enter an enchanted realm in this showing of reflective and magical art in watercolor and colored pencil drawings and fanciful photographs. Show exhibits throughout the month. Friday, Nov. 7, 2014, – 6-9PM. First Friday Gallery Tour Opening. Come enjoy harp music and micro-magical tales from artist Jane Valencia, good island company, yummy forest-and-garden inspired snacks, and nourishing and delicious herbal beverages as you browse the art. Sunday, Nov 2 – 2-4PM. Samhain harps at Galway Traders, 2-4 pm, 7518 15th Ave NW in the Ballard neighborhood. Seattle, WA. Joining with other harpers, Jane will offer harp music & gently spooky Celtic-rooted story. A long-standing annual tradition, this event is a free presentation of Celtic harp music to welcome Samhain, the Celtic new year. Enjoy beautiful harp music up-close in a cozy and informal setting presented by our region’s talented harpers! Monday, October 6, 2014 – 7PM. Two Harps And A Guitar In Concert. Vashon Cohousing Common House, Vashon, WA. Deb Knodel & Jane Valencia (Spookytree Celtic harp duo) and Steve Baughman, Celtic Guitar. Read all about this once-only event here. Don’t miss this one! Friday, October 3 – 7-9PM. Day Of The Dead Gallery Show. VIA – Vashon Intuitive Arts, 17331 Vashon Hwy SW, Vashon Island, WA, 206-463-0025. A collective of island artists will offer their works celebrating the Day Of The Dead. I (Jane) am honored to have my artwork included in this show. The art will be displayed through October, and feature a Community Ofrenda (altar) honoring our loved ones who have passed. I will play my harp during Opening on 10/3. Join us!